The PDFToJPGConverter program is able to convert all pages of a PDF document to JPG image format. Each page is converted to one image file. 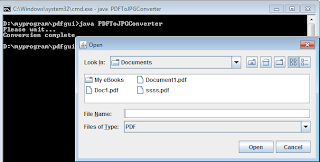 In Java, it is simple to convert a PDF document to images by using PdfBox library. You can download the library jar file at http://pdfbox.apache.org/. One additional library that you also need is FontBox. It can be dowloaded from http://sourceforge.net/projects/fontbox/. In the example code above, the PDDocument class is used to create a pdf document from the InputStream object. The InputStream object contains all data of the original pdf file. Once you have the pdf document object, you can get all pages of the pdf document by using the getAllPages method from the document catalog object. The document catalog object is returned by the getDocumentCatalog method of the pdf document object. You will use the List data structure to store all pages of the pdf document. Each page of the pdf document is represented by the PDPage object. From this object, you can convert the page to the BufferedImage object by using the convertToImage method. May I suggest that you look at our library as well? It is called jPDFImages, it is 100% Java and commercial, starting at $400 a server. Our library supports all types of fonts, images and transparency. This resource is very useful! But I also liked this one for the ease of use: Really makes it easy to convert images to PDF. I didn't have to download anything and it was really easy to use. You can also convert all image formats, it's great. I have found java code for converting a particular or all pages of pdf to jpeg format but it requires Aspose.PDF for Java Library to use this code properly. It also offers trial version so you can use that also. I want to tell you a Software who can fast conversion between formats. Click here: www.pdfconvertersale.com. It's my experience to shared you. Hope can help you. convertToImage method doesn't exist in the page object now.